Before proceeding to the review portion of the program, let’s get one thing out of the way. People who are crapping on The Great Wall for “whitewashing” have massively got the wrong end of the stick. Zhang Yimou, a lauded and celebrated auteur who has never made an American film before, has been directing since the late ’80s. He got his start after entering the photography program at Beijing Film Academy at the age of 27. And no, that’s not traditional matriculation age for that program: Zhang was a bit held up because he was serving as a farm laborer and textile worker during the Cultural Revolution, and the Academy was shuttered. He’s directed a large number of award-winning films, many of them about the resilience of Chinese people and culture. China has submitted eight of this guy’s movies as their entry in the Academy Awards’ Best Foreign Film category, and he’s been nominated three times. You’re seriously going to tell that guy he’s demeaning his own culture? Zhang Yimou doesn’t need Matt Damon to save his movie, his career or Medieval-ish China. Rather, he got the opportunity to direct a big-budget blockbuster, and he took it. These people get to work together if they want to. They get to make whatever film they want, even if it is in most ways a lame one. Obviously, “whitewashing” exists—this just isn’t an example of it. And if it’s not insulting to level that particular accusation at the director of Red Sorghum and Raise the Red Lantern, it’s at least pretty arrogant and tacky. Plus, it diverts attention from the much more serious problem: The Great Wall is a dumb film. In it, two mercenary types are pulling some kind of Treasure of the Sierra Madre deal in the deserts north of the Great Wall, seeking gunpowder. Hang onto your hats, fellas—they are Westerners. William (Matt Damon) is a badass archer, and Tovar (Pedro Pascal) is a pretty dab hand with a blade. On the run from some hill tribe types, the two find themselves hunted in the dark by a monster-beastie of unknown provenance. William brings its severed limb to the Wall, and discovers that the army who guard it are all too clear on what attacked them. These alien monsters, which are vaguely referenced as representing human greed, hibernate for sixty years between assaults on the Great Wall (and whatever else they can find). And guess what? Damon and Pascal have arrived at a super choice moment. From there (and granted, before then), things unroll as one might expect: the monsters cause the guardians of the Wall a good deal of trouble. There are a lot of improbable and unwinnable battles that get won anyway. The Chinese forces, led by Commander/General Lin (Jing Tian), perform spectacular defensive feats. Damon and Jing end up having to work together to save China from the monster-beasties and in the process they learn a little something from each other that maybe goes beyond gunpowder, archery or monsters. There is a hint of a romantic tension they both know can’t be explored so they don’t. Boom. That’s it. In other words, it’s another tedious special-effects-fest that has flimsy wisps of completely pat and predictable story blowing around interminable swaths of stuff that would 100% kill people but doesn’t, and none of the characters are that interesting. Matt Damon has given some really intelligent and powerful acting performances in his time; this isn’t one of them. (What’s that accent? Is he Irish?) 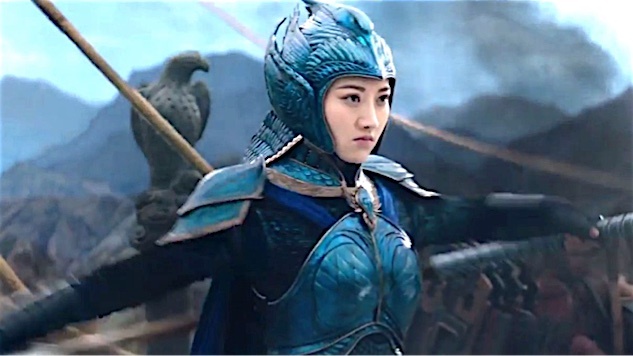 Jing Tian is a fairly standard-issue stoic military commander who happens to look really hot in her peacock blue armor. There’s a sweet supporting performance by Lu Han, but if you’re looking for “character-driven,” go see Hidden Figures; you’ll be a lot happier. That said, if you want to watch an inane fantasy action blockbuster, you might as well watch one made by Zhang Yimou. The man’s compositional sensibility is stunning. His sense of color and light, of choreography and movement, of the pictures composed by every shot, is true art even if the subject matter isn’t. At that level, it’s still Zhang’s movie, not “Hollywood’s,” and certainly not Damon’s. Every time you start thinking, “Well, this is getting a bit tiresome,” Zhang provides a high-overhead shot of the desert, or the Imperial Palace, or the monsters swirling in spirals around the monster-queen, or badass women soldiers flying off the wall with spears in their hands, and you just don’t care about what’s dumb about it because you’re too busy admiring the painterly composition of the scene. He might not have had a fantastic script to work with, but the man sure knows how to create sumptuous visuals. If that alone were enough to make a film good, this thing would be fantastic. Amy Glynn writers about literature, film and television. She also thinks a lot about grapes. She lives in the San Francisco Bay Area. You can follow her on Twitter.